The Shaggy Dog, and The Shaggy D.A. Nothing like going to the ol’ vault to promote a studio’s new movie like Disney has with Tim Allen’s new Shaggy Dog vehicle. But such a move could backfire when viewers see how dated some of the old special effects are compared to Mr. Allen’s canine-inspired CGI antics. 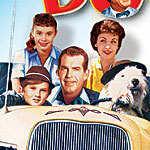 The original Shaggy Dog (1959) was Disney’s first live-action film. Ironically, it holds up much better than D.A., especially when you compare plots and contexts. In The Shaggy Dog, Wilby Daniels (Tommy Kirk) is your typical shy teenage boy, better at shooting rockets through the ceiling of his house than talking to girls, much to the chagrin of his dog-hating father Wilson (Fred MacMurray). Wilson is a mailman, so to him, dogs are a natural enemy. But Wilby stumbles (literally) upon an ancient ring with an inscription that, when read aloud, transforms Wilby, and only Wilby for some strange reason, into a sheepdog. A big, shaggy sheepdog that can talk and use ladders and door handles as if he had an opposable thumb. And drive a car. Yes, it is silly, but what is considered “family entertainment” allows for a lot of artistic license, and The Shaggy Dog spares no expense. It holds up well with its plot involving international espionage and a running gag involving two policemen running into Wilby in his speaking-dog form. It also has virtually no “Gosh Wally” or “Gee Beaver” moments that made’50s movies embarrassing, so the story could still work today. Not so with The Shaggy D.A. 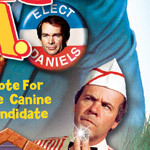 (1976), which introduces us to the adult Wilby (Dean Jones), so fed up with local crime condoned by corrupt District Attorney John Slade (Keenan Wynn) that he decides to run for the position himself. Unknown to Wilby, that same pesky ring gets stolen from a museum, falls into the hands of an ice cream pusher played by Tim Conway, who reads the inscription, and the hilarity ensues. Made when Disney’s live-action efforts were in decline and before the studio’s Touchstone was created, D.A. tries way too hard to get laughs, mostly at Conway’s expense. He has made a career out of his physical comedy, but D.A. resorts to it too much to keep the movie from lagging. Neither movie explains how, when Wilby changes from human to dog and back to human, the clothes he was wearing are back on him again. Sorta like in vampire movies, when vampires are shown not reflecting in a mirror, and their clothes do not reflect either. The sound and picture look pretty good for the DVD transfer, but stay away from the absolutely awful colorized version of The Shaggy Dog. The other extras include audio commentary and small featurettes by the surviving members of the cast mostly reminiscing about their work. Kids today are likely to not give either of these much of a look, but if you grew up on TV’s The Wonderful World of Disney, it is worth at least one more visit. But trust me on the colorized version! Ugh!